A W9 is a request for your identification number such as your social security number or other federal ID. 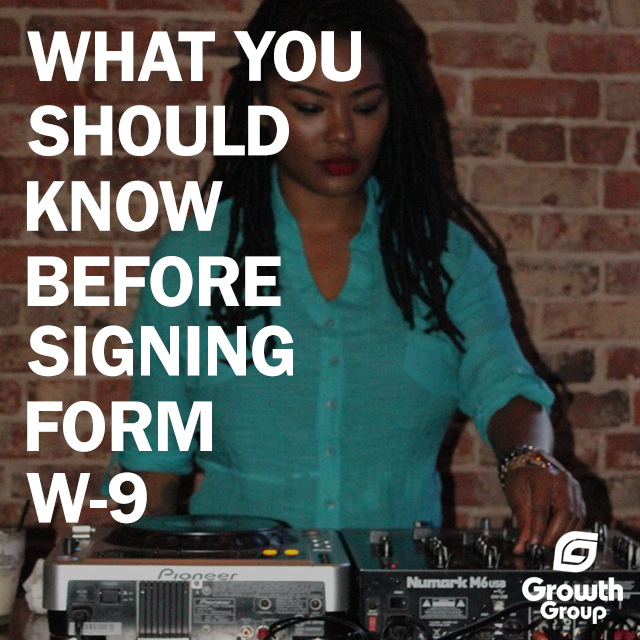 The form w-9 is used to send you (and the IRS) a report showing your income from performances you do with that group. Why is a W-9 required for an artist to perform? Before being paid, professional musicians, organizations, and venues will ask instrumentalists, backup vocalists, or event talent to provide a W9. They need IRS Form W-9 from musicians to prepare a report showing the amount they paid you for performing during the year to the IRS. You’re not an employee, so instead of a W-2 to show how much money you earned, the company will send musicians a 1099-Misc to report the amount you made. Generally, you will receive a 1099MISC if you made $600 or more total from that business throughout the year. Form W-9 is also used when registering with SoundExchange, this gives them the information to send you tax forms at the end of the year. How do you fill out a W9 form as a musician? If you’re a solo artist or sole-proprietor (meaning you are the only owner and aren’t an S-corp) enter your social security number for Part I: Taxpayer Identification Number. If you have an LLC setup but you’re the only owner, you will still use your SSN. If your band is an S corporation, enter your FEIN for the W-9. Should each band member have a separate W-9 form? The band is required to fill-out the IRS Form W9, if your band is setup as a business (such as an LLC or S-corporation). However, each band member should provide their own W-9 form to the venue or organization, if the band has no formal business set-up. The W-9 may be filled out by only one band member, however, if this is the option chosen, the “responsible” band member will request W-9 forms from the bandmates so that the full income isn’t taxed only to themselves. They will then pay each member from the money received for preforming. If I hire musicians, how do I send them a W-9? There are a few ways you can request IRS Form W-9 from the musicians you hire, depending on your communication preference. 1. Use this iPhone app for sending musician W-9 forms. They will receive an e-mail and the ability to e-sign. This is likely the fastest way to get a W-9 form signed. Here are some additional iPhone apps for music businesses. 2. If you like using e-mail, send the w-9 to the artists’ e-mail address. 3. If you like using paper, print the W-9 form from the IRS website and ask your musician to fill it out and sign it with a pen. (We’re virtual, and don’t recommend this method). Have you ever received an IRS Form W-9 Form as a musician? How did you handle it? Quick favor: Please share this post with other musicians you know, so that they can be informed in business as well. Thanks!